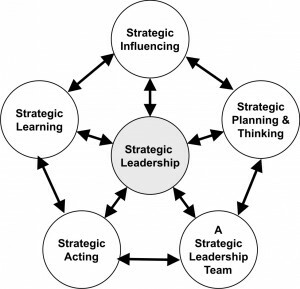 We have reached the end of this series on Strategic Leadership – twelve articles! So I thought it might be useful to sum it all up. Change-oriented: it drives organisational change, since the impact of strategic leadership ripples throughout the business. Strategic leadership involves discovering what it is that the organization needs to do well and more importantly can do well in order to grow into the future. Having made these discoveries it involves creating the conditions that enable collective effort around their implications. This can only happen if the organization understands strategy as a learning process. The primary role of strategic leadership is to enable organizations to become centres of learning, and to drive this process by continually developing and discovering strategy and holding it in an ongoing state of becoming – formulation, implementation, reassessment and revision. You need to understand who you are and where you want to go – what is the unspoken and spoken culture of the organization and it’s leadership; what is it’s mission, vision and values; where do we see it in the future (10 or 20 years); how far and in what direction do we need to travel in order to get there? You need to learn how to get there – this involves drawing on insight, information and vision to determine the priorities and craft the strategy. What are the key determinants of long-term success for your business within its specific industry; how will we address the human and organisational capabilities that are essential to the implementation of this strategy? You need to make the journey – translate the strategy into action; into tactics; and get movement in every part of the organization. While the CEO is ultimately responsible for deciding which path an organization should take, many people in all parts of the business play a part in its strategic leadership. Since strategy is a process of discovering, it has both top-down and bottom-up elements. Failure to enable this means that you may miss critical information and opportunities. Whoever makes decisions that have consequences for the rest of the organization is in a position to and should exercise strategic leadership – no matter how high or humble they may be. In addition, strategic leadership is a collaborative, team activity, enhanced by the work of strategic leadership teams whose collective work has strategic implications for a business unit, product line, service area, functional area, division or company. It is the key skills of strategic thinking, strategic acting and strategic influencing that drive strategy as a learning process in organizations. Strategic influencing is about creating clarity, commitment and synergy throughout the organization by influencing and energizing the right people. And these three elements interact in a dynamic way – strategic leaders need to draw upon the knowledge, experience and insight of diverse stakeholders in order to address a particular organisational challenge; they need to make sense together of what the future holds and how to deal with it; so thinking and influencing happen simultaneously. Similarly, strategic thinking and strategic acting might happen simultaneously given that we often don’t have the luxury of the time it takes for deep and prolonged strategic thinking before action is required. I hope you have found this series interesting and inspiring. Look out for our new series beginning soon.